In our final gaming mice tech roundup of 2015, we brought in 6 gaming mice of different types, grip styles and price points to help you determine where you should drop your cash this winter. We kick things off in this rodent rumble with the classic Razer Diamondback. Originally launched in 2005, the Diamondback was the first ever optical gaming mouse, and it was a great one, offering unprecedented all-round performance for the time. We know as we had one here at T3 Towers back in the day. Now, 10 years down the road, Razer have resurrected the Diamondback, augmenting its original design with modern specs and some wizzy custom lighting. In terms of core specs, the Diamondback is cutting edge. Equipped with a 16,000 DPI, 5G sensor, the mouse is insanely accurate and offers a lift-off cut-off distance as precise as 0.1 mm. The mouse also boasts 1,000 Hz Ultrapolling, seven programmable buttons and is enabled for Synapse, Razer's own unified configuration software. The Diamondback measures in at 125x60x30 mm and weighs 89 grams. It comes in a wired variant only. The Diamondback is packaged in a black, top-access cardboard box with front-opening viewing window. As aforementioned, here at T3 Towers we were a huge fan of the original Diamondback and, unsurprisingly, we're a fan of the new one too. Razer have, wisely, changed almost nothing about the mouse's form-factor and aesthetics, which is great as the small, clean design works well for all grip types. The new sensor and lift-off accuracy make the mouse an excellent choice for first-person shooters, offering smooth and responsive control when you are under fire. It's fine too for standard desktop use. The mouse is light and slick to move across a desktop or trackpad also. You want a premium gaming mouse that can function well in a variety of situations, both in-game and out. You're looking for something specific, such as a mouse for MMOs. You're looking for a wireless gaming mouse. You're not flush. Basically nothing. A slightly heavier build maybe. £10 cheaper would be nice too. From our testing, the Diamondback's pedigree remains firmly in-tact and if you've got a hefty chunk of change to spend on a mouse there is basically no way the Diamondback could let you down. A minimalist but great all-round gaming mouse. The Danish company SteelSeries has a solid reputation for building premium-grade gaming peripherals. It doesn't, however, usually do budget products, which is why the Rival 100 is so interesting as it currently sits at the bottom of SteelSeries' range of rodents. Indeed, there is the Rival 300, Sensei RAW, Sensei and Sensei Wireless all sitting above this in the SteelSeries pecking order. However, here at T3.com we chose the Rival 100 as firstly it is brand new and secondly we want to cover all bases in the Ultimate Mouse Quest: Winter 2015. After all, not everybody wants to spend north of £60 on a gaming mouse. Under half the price of the Razer Diamondback, the Rival 100, if judged on price alone, would go a long way to crushing this group test. That £30 price point is really, really attractive. What do you get for the money though? Well the Rival 100 is fitted with a 3059-SS, 4,000 DPI sensor with 8 step increments and 20g acceleration. It's also equipped with SteelSeries' Prism RGB illumination tech - allowing you to adjust the colour of the mouse's light points - and its rubberised Soft-Touch texture skin. It has six clickable buttons, measures in at 120x67x38 mm and weighs 120 grams. The Rival 100 comes packaged in a black and red cardboard box. Using the Rival 100 is an interesting experience. It just does its job, and does it well, without any fuss or show. We used the 100 in a variety of games and it performed just fine. Its side buttons are well defined, it tracks smoothly and - and we know this is a love it or hate it thing - we liked the rubberised coating. It was, simply put, a little understated. Whether or not understated works for you, especially considering the competition out there, is up to you to decide. You want a good quality gaming mouse for little money. You want the absolute best technology on the market right now. You need some drama in your mouse. For the price we really wouldn't expect any more from SteelSeries. A really solid mid-tier all-rounder that, as the saying goes, delivers a lot of bang for your buck. If you were to go to Burger & Lobster, the overrated hipster chain of choice, you'd spend more money on a beef burger than you would on the Xornet II. Off the bat, that it quite impressive for a mouse in the 'gaming mice' category, as it is a quarter of the price of the Razer Diamondback. The question is though, do you get a quarter of the specs, or does the Xornet II punch above its weight? The Xornet II is equipped with an Avago 3320 Optical Sensor capable of 3 sensitivity steps up to a max 3,500 DPI. Mouse acceleration sits at 20 g, it has 7 programmable buttons and sports a lift-off distance of less than 3mm. The mouse's body is plastic, with each side featuring rubberised gripping areas. The Xornet II measures in at 105x76x37 mm and weighs 132 grams. It is fitted with a 1.8-metre, non-braided power cable and comes in a black, top-access cardboard box with front-opening viewing window. Cooler Master's unique design equates to one fat little mouse. The Xornet II is 10 mm wider than the SteelSeries Rival 100 and a whole 16 mm wider than the Razer Diamondback. The reason for this is the inclusion of a right-mounted, ring finger rest. These tend to be favoured by claw grip gamers as, without them, purchase can sometimes be lost in heated battle (the two fingered grip is inherently less stable than palm). Due to its claw-centred design, it is also rather squat, with a low profile on the desktop. Here at T3.com we're not elite level gamers, with our 'Pro' careers ending that time we played Fatal1ty on Quake III Arena, so the marginal gains delivered by super high-end mice are often lost on us. This been taken into account, we actually found the accuracy to be just fine on the Xornet II, which hides its low price well on screen unless really scrutinised. Where the Xornet II doesn't deceive in our eyes, is in its body's ergonomic feel and aesthetic presence, which feels and looks a little plasticky. The same is true with scroll wheel and buttons - it's not as if they feel bad, they just don't feel premium. In addition, as the mouse wheel is the only light point, the 16.8 million colour system seems a token, unoptimised inclusion. You want a decent gaming mouse for peanuts. You have more than £25 to spend on a gaming mouse. More light points. A different texture for the body. On balance, I don't think you can really ask for much more from a gaming mouse that costs just £20. The Xornet II handles the role of a gaming mouse well, it just can't hide its budget background totally in looks and feel. It is, however, probably the best choice on the market right now if you are on a low-end budget. A second entry from Razer in our winter roundup, the Mamba is the American mouse giant's flagship. As you would expect from a top-of-the-range mouse, the Mamba comes packed with a dump truck load of features and functionality. It also comes with one hell of a price tag. The new generation Mamba - the original being launched in 2009 - was unveiled at E3 this year and promised to leave Razer 'ahead of the curve when it comes to gaming mice'. Whether or not that was true was something we were keen to discover for ourselves. There is no escaping the fact that the specifications on the Mamba are incredibly advanced. That said, at that price point, they damn well should be. Headlining the specs is the same 16,000 DPI, 5G sensor that is fitted in the Razer Diamondback which, as mentioned before, is insanely accurate. The unique selling point with the Mamba though is its variable Click Force technology. In simple terms, this allow you to alter the click force necessary to actuate the main left and right mouse buttons. The idea is that by altering the click force to max (95 g), then you can avoid accidental button clicks during intense gaming action. Equally, by setting the click force to a low setting (minimum 45 g), you can make the buttons more responsive, allowing for quicker reaction times. The click force is altered by rotating an included mini-spanner in two sockets located on the underside of the mouse. The Mamba measures in at 128x70x42.5 mm and weighs 125 g. Battery life is estimated at 20 hours between recharges, with the Mamba magnetically docking to its elevated charge station diagonally. The Mamba can also be connected up as a wired mouse. First things first, if you like your unboxings then the Mamba will definitely not disappoint you. The box the Mamba comes in opens first with a front swing door. This reveals a black, metal tin embossed with the Razer logo. Open the tin and beneath a welcome card from company CEO Min-Liang Tan you find the Mamba and its charging dock nestled within black padded foam. Its an impressive introduction to the mouse and lets you know immediately that you just dropped over £130 on a mouse. Of course, it's how the mouse functions rather than how it's packaged that is important. To cut to the chase, the Mamba performs incredibly well. That 16,000 DPI sensor has not suddenly turned crap in the Mamba and it allows for superb accuracy in all applications. The Click Force technology also transcends gimmick in our view, with noticeable, real-world uses (especially in culling alternate fire miss-clicks). In terms of aesthetics, the Mamba also looks amazing, with some restrained illumination points giving you colour in a subtle way. We especially liked the twin grills at the front too, which gives the otherwise sleek Mamba an aggressive front profile. We couldn't however distinguish it in terms of general performance from some of the other high-end mice here on test so we're guessing that unless you are a tournament-tastic, pro-gamer then you won't too. You're loaded. You want a premium wireless gaming mouse. You're a first adopter. You're quite happy with a wired gaming mouse. You're brassing it. If wireless and click force really turn you on then the Mamba is an excellent, super high-end choice. If not, then this is probably too much mouse for you. There are wired alternatives in this group test that deliver similar performance at half the cost. The second entry from Cooler Master in this roundup is the Mizar, a multi-use gaming mouse targeting gamers who prefer a palm grip to claw or fingertip. More expensive than the entry-level Xornet II, the Mizar falls roughly in line price wise with the Rival 100, costing just an extra £5. As such, we were interested to see just what this modestly priced mouse was capable of. Well, to start, the Mizar comes packed with an Avago ADNS-9800 Laser Sensor capable of up to 8200 DPI. The mouse also has a max lift off distance of under 2.1 mm, 30 g acceleration and 128KB of on-board memory. One lighting point is included on the mouse's body and seven different colours for it can be selected. The Mizar's body is made from smooth plastic, while either of its sides are covered with indented rubberised coatings. The cable supplied is braided. Finally, the Mizar measures in at 124.8 x 60.4 x 40.2 mm, weighs 121 grams and comes packaged in black and silver top-access cardboard box with a front swing-door opening viewing window. Straight away, the first thing that hits you with the Mizar is how comfortable its design is. Out of all the mice on test here, if you use a palm grip then this mouse is the most comfortable to use - it just seems to fit your hand perfectly. Take away the palm grip however and it falls back into the throng. Don't get us wrong, you can totally use the Mizar with claw and fingertip grips, it's just not as stand-outy then in terms of ergonomic comfort. Away from ergonomics the Mizar also performs well, especially in terms of tracking. Again, with our non-pro gaming skills, we struggled to really differentiate this mouse from others in terms of accuracy, however in terms of tracking it was buttery smooth - moving really well across both our test surfaces and the screen. The side buttons are big and actuate well too, while the scroll wheel's central strip of rubberised material makes it feel good under the fingertip and looks smart. You prefer a palm grip when using a mouse. You have a modest budget and want a good all-rounder. You've got north of £60 to spend on a gaming mouse. You prefer a claw grip. As with the Xornet II, a different textured plastic for the main body. 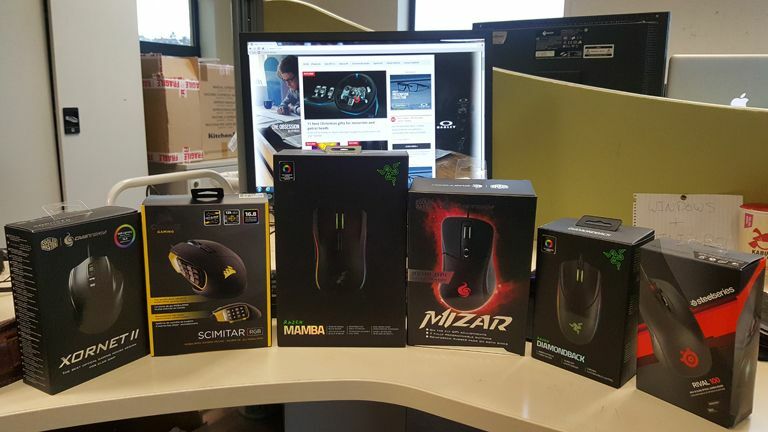 How we see it here at T3.com is that the Mizar is the biggest all-rounder of all the all-round gaming mice on test. That doesn't mean it is a jack-of-all-trades and master of none, far from it, as the sensor, tracking performance and shape are great. No, instead it gives you great all-round performance at a very appealing price point (it's £100 cheaper than the Mamba). £35 for an 8200 DPI gaming mouse with smooth tracking, 7 omron-switched buttons and a really comfortable design is superb value and if you've got this sort of cash to spend then it's a really solid choice. Things get specialised now as we enter into the weird world of MOBAs and MMOs. Simply put, if you play a lot of WoW or Dota 2 then read on. If not, then you should probably read on still, as the Corsair Scimitar is an excellent mouse, regardless of whether you need 12 mechanical side buttons or not. Corsair don't have the widest range of mice and we think you'd be forgiven for not immediately thinking of the component giant when asked to list gaming mice manufacturers, however, you should do as from our experience they know what they are doing. For example, the previously released Corsair M65 RGB is a top gaming mouse, combining an aluminium frame, good sensor and really solid design to produce a super mouse for first person shooters and more. Do they bring an A-game to the Scimitar though in the same way? The Scimitar comes with a 12,000 DPI optical sensor, which can be scaled from 100 DPI upwards. It also has a grand total of 17 programmable buttons. In terms of illumination the Scimitar has 4 RGB light zones, which can be customised with 16.8 million colours. The Scimitar also has an unspecified amount of on-board memory. A 1.8-metre braided cable connects the mouse to the computer of choice. Finally, the Scimitar measures in at 119.4 x 77 x 48.8 mm, weighs a hefty 147 grams and comes packaged in a black and yellow top-access cardboard box with front swing-door opening viewing window. The Scimitar is one hell of a good looking gaming mouse. In fact, despite having 17 buttons mounted on its body, somehow it manages to come away looking both sleek and pleasingly chunky and well built at the same time. It's as if the M65 RGB and Xornet II had a baby, the sculpted lines of the latter mixed with the aggressive profile and manly build of the former. The black and yellow colour scheme is also just lovely - it stands out without looking garish or childish - and the body's finish is soft. We just loved the exposed scroll wheel too, as well as the small glimpses of the brushed metal spine that runs through the heart of the mouse. The touted Key Slider system, which holds the Scimitar's block of 12 macro buttons, can be moved a distance of 0.7 mm in a front-to-back orientation and is well implemented, with a locking mechanism ensuring unwanted movement. Away from the aesthetics, the mouse performs as you would expect from a unit aimed at non-twitch gameplay. It's heavy and certainly not designed to be leaving the surface often, with the side buttons giving little purchase. It does track well though, although it is not in the same league as the Mizar or Diamondback in terms of smoothness. Accuracy is good as well, as too the actuation of its buttons, with the tightly packed macros differentiable by touch alone. You play a lot of MMOs and MOBAs. You like macros. You're a FPS monster. You don't need 17 buttons on a gaming mouse. If it could move a little smoother that would be just lovely. It's a comprehensive control station for your right hand that has been designed for prolonged gaming sessions. On top of that it's a bloody good mouse for general usage. Editing photos and browsing the Internet is definitely a pleasant experience despite these uses not really being the Scimitar's raison d'être. Overall though, the biggest compliment we can hand to the Scimitar is that if you strip away all the 'it's a mouse for MMOs and MOBAs', then it's still a mouse that we would use when not playing Dota 2.